April 12: Participants at the Briefing Session on Effective Right to Information asked that the Punjab Government must urgently appoint Punjab Information Commissioners whose posts have been vacant since March 2017 and facilitate more effective usage of RTI across Punjab by citizens. These views were expressed at the Closing Ceremony of PILDAT’s project: Enhancing Empowerment of Women and Minorities of South Punjab through Effective use of RTI Law, with the support of USAID Small Grants and Ambassador’s Fund Program. The briefing session and closing ceremony were organized by PILDAT in collaboration with the Punjab Information Commission (PIC). 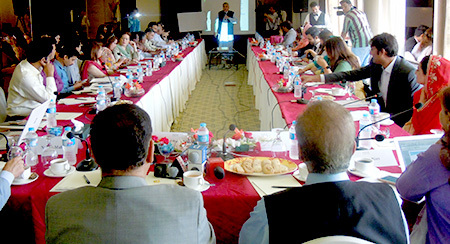 Speaking at the occasion, Mr. Mujib-ur-Rehman Shami, Senior Journalist/Anchorperson, suggested that PILDAT should propose an amendment in Punjab RTI law that should ensure that sitting Information Commissioners should continue in their posts until new information commissioners are appointed by the Government. This would ensure that Information Commissioners’ posts are never vacant in the Punjab Information Commission at any time. He urged the Punjab Government to increase the allocation for Punjab Information Commission. Mr. Shami also suggested that all media houses should hold workshops on RTI for their staff to change the existing culture of sensationalism in media to fact-based reporting and analysis. Mr. Habib Akram, Senior Media Analyst, said that he learnt a lot from the Briefing Session about the scope of the Punjab Transparency and Right to Information Act. He added that every forum must be used to demand that Information Commissioners are appointed forthwith in Punjab. He also said that media must effectively use RTI for its work. Speaking on status of implementation of RTI Law in Punjab, Mr. Naeem Malik, Deputy Director, PIC, said that the Punjab Transparency and Right to Information Act 2013 is functional even though Information Commissioners posts are vacant at the PIC. He said that the PIC has received 4000 applications, all of which, except 400, are resolved by the PIC. Speaking on the subject of RTI Law; International and Regional Observations, Prof. Kalim Ullah, Former Information Commissioner, KP said that India has the strongest track record in leading and implementing RTI legislation. India’s legislation on the RTI began in its States in 1997, with ten State legislatures passing RTI laws. This happened because of a fierce grassroots movement led by Indian peasants and farmers — Mazdoor Kisan Shakti Sangathan — who demanded freedom of information and transparency and linked it to their “right to live” and now their CSOs and media play a very active role in promoting this right. Earlier, Ms. Aasiya Riaz, Joint Director PILDAT, said that the Punjab Transparency and Right to Information Act (PTRTIA) 2013 is considered as an important landmark in the quest for transparency and accountability of the public bodies. This Act promises “to provide for transparency and freedom of information to ensure that citizens have improved access to public information; to make the Government more accountable to citizens.” However, the law has not been effectively utilized across Punjab. PILDAT has continued to support the effective utilization of right to information in Punjab, as in other provinces. 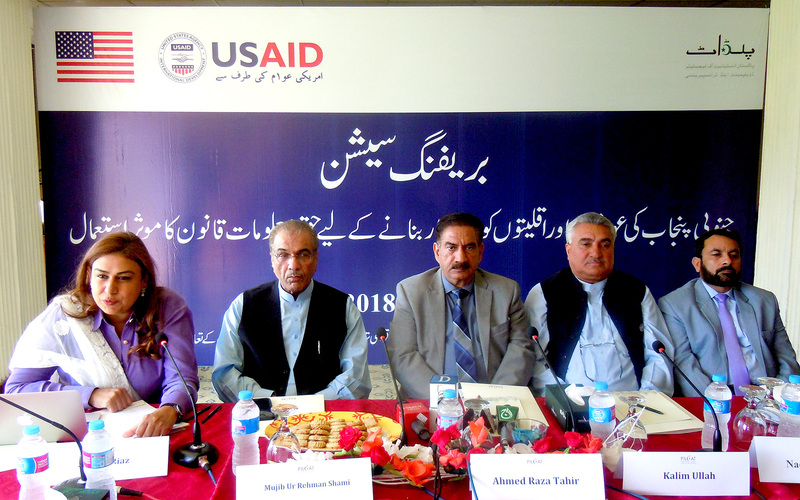 Through the project of Enhancing Empowerment of Women and Minorities of South Punjab through Effective use of RTI Law, with the support of USAID Small Grants and Ambassador’s Fund Program, PILDAT has targeted South Punjab and trained Public Information Officers (PIOs) in Government departments and briefed more local government officials, CSOs and media, non-Muslim minorities and women in South Punjab. He shared that through this project we have conducted 02 Training workshops for more than 80 PIOs belonging to district Bahawalpur and Lodhran, and 04 Briefing Sessions for more than 200 people hailing from both districts and Lahore. The briefing session saw active and engaged interaction among participants and resource persons. Participants mostly said that they were not aware of the law and will not only share information received at the briefing with others but also make efforts to use the law to seek information from public bodies. The briefing session and project closing ceremony was attended by 90 participants including local government representatives, women, representatives of non-Muslim minority rights organisations, civil society organisations working to promote citizens rights, peace and tolerance and media representatives. Interactive discussions on effective usage of PTRTIA 2013; its scope and exemptions took place. Benefits of Media and CSO alliances for RTI were also highlighted and appreciated by the participants.